ALVA is the perfect racking system for your flat roof applications PV Mounting without any Risk of Roof Failure. 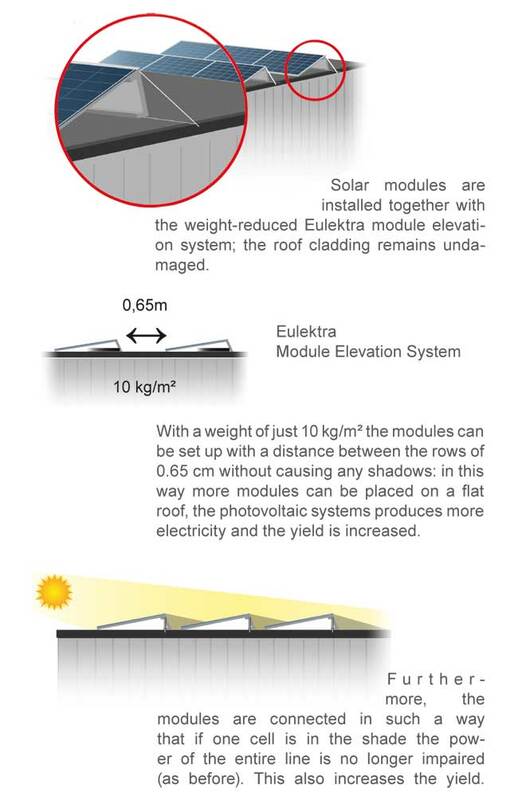 ALVA mounting system has been developed to make photovoltaic projects for flat roofs more economical, durable and reliable. ALVA innovative racking system was designed without the need for roof perforating fastening methods, nor does the system require stones, gravel for ballasting. ALVA modular racking system offers a significant reduction in weight – Just 10kg (22lbs) per square meter (10.7 sq. ft.). ALVA the innovative, easy-to-use and money saving solution for flat roofs. No more leaking roofs and costly repairs. The superior design allows for a more flexible and overall roof usage. Every ALVA system is sold with a complimentary ballast calculation and roof layout. The innovative design provides for optimal module ventilation and optimal water drainage. ALVA is a statically optimized system, considering that aluminum expands and contracts as the temperature changes, the floating ALVA system is also flexible within itself, protecting panels against possible damage caused by rapid temperature changes. The ALVA system was officially tested at hurricane wind speeds inside a wind tunnel by Deutsche WindGuard Engineering GmbH. The original report (in German language) can be viewed here.